I think it’s been a little while since I shared any updates about Biscuit! 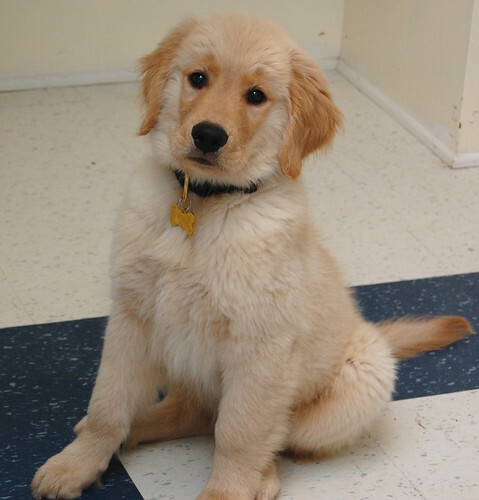 Well, he’s growing – he’s now a whopping 21 lbs and not showing any signs of slowing down. 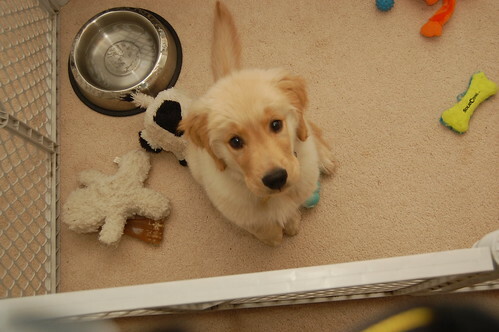 He’s even starting to lose his “puppy face.” Aww..
My go-to cake for potlucks – a Williams-Sonoma recipe. Growing up in the Bachetti household, we had certain culinary patterns. Friday night was pizza night (and TGIF! I loved Family Matters) and Monday night was spaghetti night. Not pasta night, spaghetti night. Every Monday we’d have your classic spaghetti pasta, sauce from a jar (Ragu) and garlic bread. Every Monday. And. I. Loved. It. 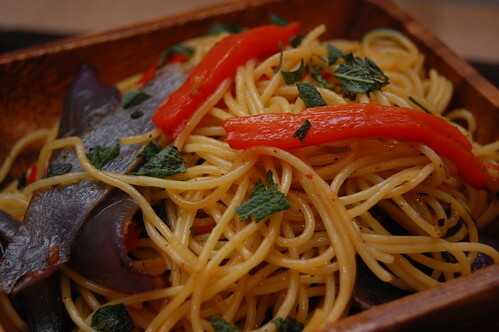 I loooooooved spaghetti growing up (really, I love all carbs). That being said, there wasn’t a whole lot of variety in the dinner lifestyle. My father is not a big fan of variety and, well, kids hate “weird stuff” so my mother was rather constrained. Spaghetti night died when we went off to college but I’m still in love with my carbs. Ragu, of course, does not sit on my shelves, but then there are so many other delicious sauces (don’t tell my dad). A friend and I made ravioli from scratch some time back using a recipe from Alton Brown (of course). It was delicious and used a very subtle, very simple sauce: butter and sage. I decided to give it a shot with this recipe. If I had to do it again, I’d probably add more herbs to the vegetables for the roasting; something to add more “pop”. Maybe more basil, some parsley? Cook your spaghetti as you normally would halfway through the process so it finishes around the same time everything else does. Preheat the oven to 450. Put your onions and carrots in a bowl with 2 tablespoons of oil (enough to coat, but not “wet”) with a generous pinch or two of salt. Toss to coat and put, uncrowded, on roasting pans. Put the red bell pepper on its own roasting pan. Put the onion and red bell pepper in the oven. 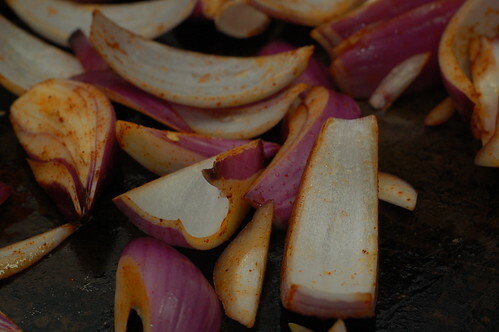 Toss the onion after ten minutes and remove after another five. 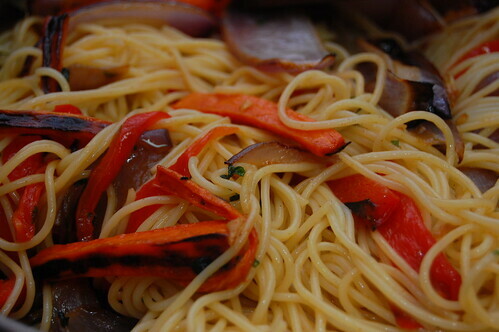 Place the carrots in the oven and remove both them and the red bell peppers after five minutes (20 minutes total). If the red bell pepper’s skin is not charred enough, let roast longer. Otherwise, place in sealed bag and let sit. Once the red bell peppers are cool enough to handle, remove their skin and cut into 1/4 strips. Melt the butter under medium heat (if it sizzles when it touches the pan, it’s too hot!) until it begins to brown, add your sage, garlic and basil and cook until the garlic is fragrant; approximately 30 seconds. Add your vegetables and pasta to the pan and toss to coat. Enjoy! Two great friends came to stay with us last weekend from Chicagoland for a wedding. They decided to extend their weekend trip a bit and take advantage of the great camping opportunities on the Skyline Drive. With the camping in mind, I decided to make Trail Mix Cookies. But I wanted to improve on my previous recipe. 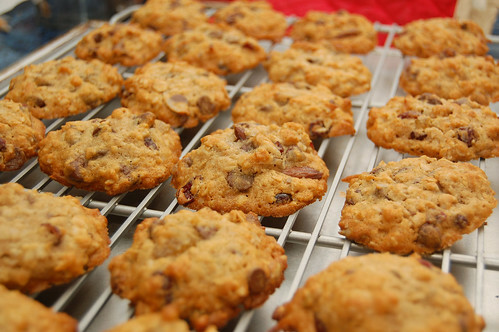 Those cookies had an awful lot going on… much like Everything Cookies. I wanted to tone it down a bit, so I replaced the peanut butter chips and white chocolate chips with additional semi-sweet chocolate chips. This allowed a little more enjoyment of the dried cranberries, almonds and golden raisins with a hint of chocolate. Please do read my previous post for some information on agave syrup, what I used in place of sugar. It’s a more natural sweetener, especially good for diabetics. 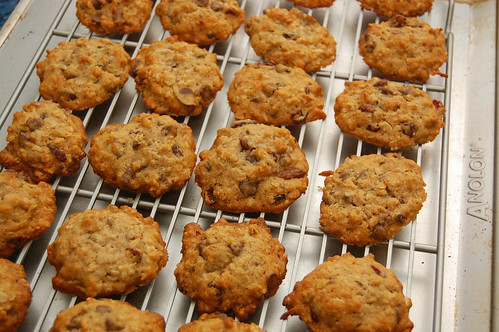 It also makes the cookies soft – you won’t get a crunch using agave. What will throw you off the most about working with agave is that you’ll think you messed up when combining ingredients. Agave doesn’t blend very well at first with the butter and it seems to separate a lot… but when you add in the dry mixture you’ll see that everything is fine. Just have a little faith! Preheat oven to 350 F. In a large bowl, combine granola, trail mix, oats, semi-sweet, white and peanut butter chips, and coconut. Set aside. 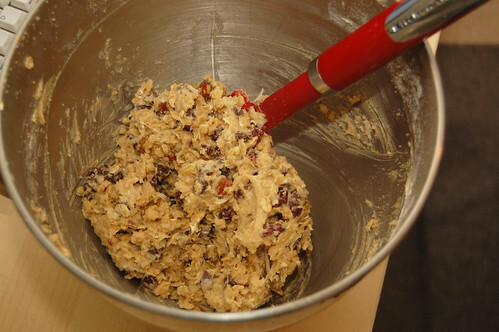 In a medium bowl, sift flour, baking soda, baking powder and salt. Whisk to combine. Beat room temperature butter until smooth. Add agave syrup, vanilla and egg. 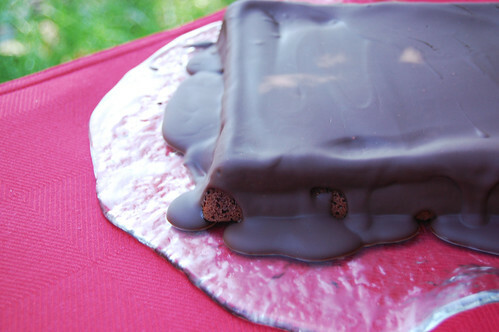 Beat well (don’t get discouraged when it looks clumpy and like it isn’t holding together… that’s normal!). Fold in flour, baking soda, baking powder and salt. Then fold in granola, oats, trail mix, chips and coconut. 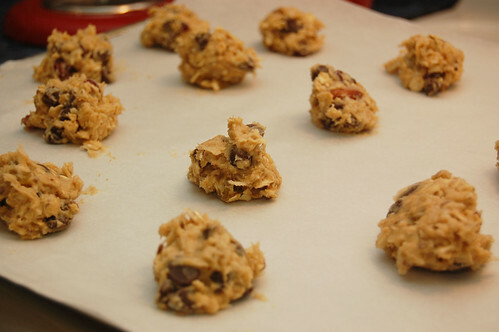 Use a tablespoon to scoop large balls of dough onto a parchment lined baking sheet. Place balls approximately 2 inches apart. Bake approximately 12 minutes. Cool on baking sheet for 3 minutes, then transfer to wire rack to cool completely (these cookies cooled surprisingly fast). Store in an air-tight container. Garlic can be a bit annoying to work with at times when trying to mince it. The darn stuff just sticks to everything, regardless of the kind of knife you have. One nice trick that I’ve come across to help against this is to add a drop or two of oil to the cloves to coat it. This will keep it from sticking to both your hands and your knife. I’m on a dinner roll this week (get it? dinner… roll…? i should not be allowed to tell jokes)! Shrimp & Grits on Tuesday was a new fave, today’s recipe is an old, old fave. This recipe is from a cookbook put out by the teachers and administrators at my elementary school. Yep, my elementary school… in the 80’s. But my mom tried it one night, probably almost 20 years ago, and it has been a family staple ever since. I used to request it for my birthday every year, and I never understood why when friends came over for a birthday dinner they never got as excited about Chicken Casserole as they did about Pepperoni Pizza. That’s right, I’m talking about casserole. I know that in today’s world the word “casserole” strikes a bit of fear into our hearts. 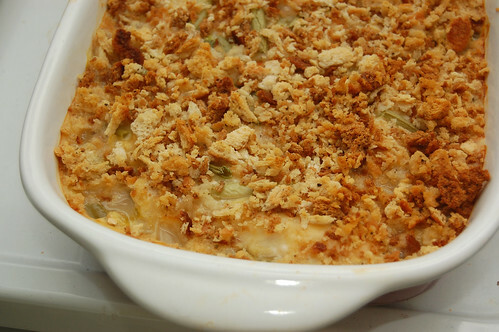 We think of a leftover tuna casserole in our grandmother’s fridge… right next to the green ambrosia. You know what I’m talking about. Americans used to thrive on casserole, now we’re terrified. I’d rename it something with less baggage, but maybe I can reclaim the world and turn it back into something positive… take it back to when it meant making a quick and easy dinner and only having to dirty one pan. One pan! This dish makes enough for leftovers on a busy night. What I love most is the hint of white wine that comes through. Don’t overbake it, or you’ll be left with sad, dry chicken. Preheat oven to 300F. 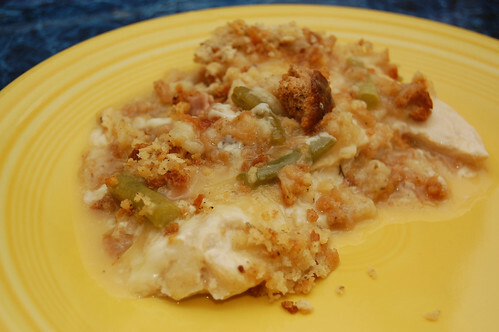 Place halved chicken breasts in a 9×13 baking dish and top with Swiss slices. In a medium bowl, thin the soup with the white wine and mix until smooth. Pour mixture over chicken and Swiss. Rinse bowl, and combine stuffing mix and melted butter. Stir, moistening stuffing, and sprinkle over top of the dish. Season with salt and pepper. Bake at 300F for 1-1/2 hours. Can be made ahead. 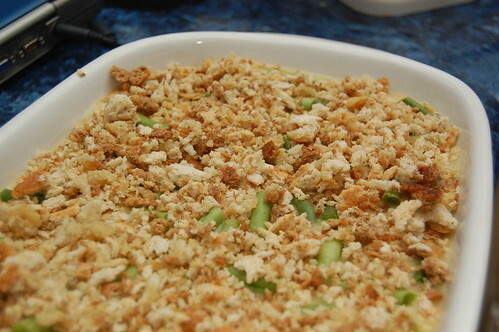 Note – I added a handful of green beans to my latest batch, just to introduce some veggies in there. I didn’t feel it added anything tremendous flavor-wise, so I might suggest making your veggies as a side rather than adding them to the dish. My cooking/baking/decorating idol Martha Stewart has released her Thanksgiving favorites. I’m so excited for Thanksgiving cooking and baking that I can barely contain myself. Do you know what you’re making yet this year? Hello everyone! The weather in DC is totally screwing with me lately; fluctuating from cold to chilly to pleasant in a matter of days. My culinary barometer doesn’t know whether or not it should be pointing in the root and squash vegetables of winter or forge on with the lighter meals of summer. I’ve decided to let time being the deciding factor. Being the cheapskate I am, I rarely work with fresh herbs. With a gift of some potted plants I’ve been trying to turn that around. Ever worked with dill? I don’t think I have. The most exposure I’ve had to the stuff is snickering at the local grocery store while reading the dried herb container labeled “Dill Weed”. (hah! still cracks me up) It’s a hard flavor to describe, reminding me a bit like a mild cilantro but also maybe parsley like. I also had a brief flash of cucumber! 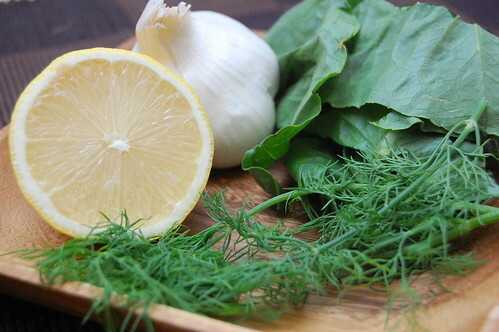 The lemon and garlic, however, kick its influence up. 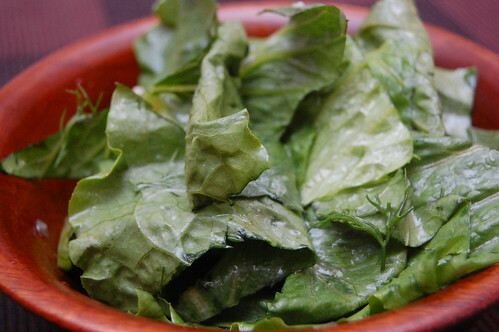 Add this to a simple salad of lettuce; perhaps with carrots or scallions.